Sometimes when it comes to working and going to school you can get bogged down and forget to take time to enjoy the small moments. As I been living up in the north and in a small town , I have been trying to advantage of every opportunity to have fun and take time away from school and work. One way that I have been relaxing is by being out in nature and just having moments to be alone. I have been trying to do this by seeking out opportunities to go look out at the stars in the sky. This is something that I have not normally have been able to do being from a big city, which is why I love the small town feel that Grand Forks has. There have been a couple times that me and some of the other Hall Directors have tried seeking out the northern lights while we are up here. The northern lights occur when there could be a collision between the electrically charged particles from the sun that enter the earth’s atmosphere. When this happens it creates an aurora of red, blue and green lights in the sky. We have heard about this multiple times and have never seen them. There are a couple of close calls where we have checked the radar and thought we would but nothing happened. We checked the aurora forecast this week and thought we may have finally caught them happening. We left campus and could tell they were already starting to form. We started to drive outside of the city limits to see if we could get a better view. What we ended up seeing was absolutely breath taking. 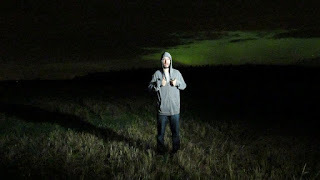 It was amazing to see the different parts of the sky and how the aurora was showing. Being able to have this experience was able to bring me back to reality. It let me realize that even through all the stress I am going through, that there can be some good in my day. It is important that every once in a while I am taking the small things in and having moments to myself. What does your environment say about you? How Student Affairs Can Work with Faculty!